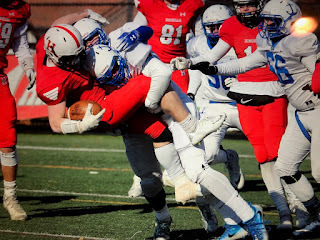 While some may say that the new MIAA playoff format has lessened the meaning of Thanksgiving Day, there is no question that across the Bay State on Tuesday, Wednesday, and Thursday a bevy of teams went out there hungry to secure a victory in their season's final game. To begin the week, Foxboro defeated Mansfield at Fenway Park, 35-33, in a triple overtime thriller. One day later back at Fenway, Xaverian secured its fifth Catholic Conference title in six years defeating St. John's Prep, 14-12, in front of a terrific crowd. Framingham followed up by upsetting Natick, 14-6, in the 113th meeting between the two teams to snap a six game losing streak to the Redhawks. Due to the frigid cold temperatures that encapsulated Massachusetts on Thanksgiving Day, a handful of games were moved to Wednesday night. The day saw its fair share of standout performances with James Dillon setting the Lincoln-Sudbury program record for rushing touchdowns, Zach Sanderson surpassed the 2,000 yards rushing mark for Northeast Regional, and Jay Brunelle capped off his season with 1,157 receiving yards to his name. Of course Thanksgiving Day itself brought plenty of memorable moments. Twin brothers Zach and Luke Maffeo went head-to-head, with Zach getting the better of his brother in a win for Latin Academy over O'Bryant. Falmouth and Barnstable played met for the 137th time with Kyle Connolly stealing the show in a Clippers victory. In the oldest public school Thanksgiving Day rivalry in the country, Needham survived a late Wellesley surge to come away with a 14-13 victory. Connolly showcased his talents with his legs, running for 303 yards and on 35 carries and four touchdowns as Falmouth closed out its season with a 36-14 win over Barnstable in what is simply known as "the game." It was a memorable Thanksgiving Day for Gonzalez on multiple accounts. Not only did the senior running back's 174 yards and three touchdowns propel TechBoston to a 48-6 win over Cathedral, but it also pushed him past 2,000 yards for the season. The physical back turned in another big performance on Thursday, carrying the ball 36 times for 182 yards and two touchdowns to lead King Philip to a ninth straight Thanksgiving Day win over Franklin, 23-16. Silvia's explosiveness was not hampered by the cold. In his final game in a Wamps uniform, Silvia ran for 196 yards and four touchdowns to lead Braintree to a 35-21 win over Milton. Despite the blistering winds on Morrissey Boulevard, Pratt was sensational finishing 5-of-7 for 157 yards and four total touchdowns as Catholic Memorial claimed the Pumpkin Trophy with a 37-15 win over BC High. McCarthy was effective in all three phases on Thursday morning. The Falcons senior running back closed out his career in style rushing for 132 yards on 18 carries, catching five balls for 83 yards and a touchdowns, and amassing a 20-yard kick return as Danvers defeated rival Gloucester, 20-0. Mazza came through in the clutch for East Longmeadow, scoring the game tying touchdown with 5:30 left before carrying the ball six time for 54 yards and plunging in for the game winning score on the next drive as the Spartans defeated Longmeadow, 14-7. Foley made sure Foxboro capped off its season in illustrious fashion as the senior quarterback threw for 167 yards and three touchdowns to lead the Warriors to a triple overtime victory over Mansfield at Fenway Park. Bianchi's dual-threat capabilities were on full display as he threw for 169 yards and three touchdowns and rushed for 123 yards and two more scores to lead Lexington to a 40-27 win over Burlington. Dillon became the all-time single-season leader and career leader in rushing touchdowns for Lincoln-Sudbury as he rushed for a pair of scores to lead the Warriors to a 49-14 win over Newton South. For the season, Dillon finished with 20 rushing touchdowns while amassing 34 for his career. Jameson scored five times, finishing his career as the all-time touchdown leader in Oakmont history with 52, as the Spartans defeated Garnder, 56-6.